15 Best Winter Activities to Do in Arizona! It's hard to beat winter in Arizona. With Phoenix temperatures regularly in the 60s, many snowbirds flock south to hibernate in the warm weather and sunshine. Head just a few hours north, however, and snowy Flagstaff looks like a winter wonderland. With that said, there are seemingly endless possibilities of activities in Arizona during the winter. Here are 15 great things to do if you find yourself in the desert this winter. Over the last 25 years, ZooLights has become the de facto holiday tradition around Phoenix. Hosted by the Phoenix Zoo and presented by SRP, ZooLights is an epic display of holiday lights in an exotic setting. Come to the zoo after dark, grab some hot cocoa and walk around as millions of lights illuminate the park. ZooLights is set up with hundreds of light displays, including a three-story holiday tree and a lakeside music-in-motion show. ZooLights runs annually from Thanksgiving until early January and ticket prices vary. Many Arizonans make annual treks to Colorado and Utah to get their skiing fix. However, Arizona has two worthy ski parks right in our backyard. Sunrise Ski Park, located in Greer, consists of three mountains ripe for skiing, snowboarding, sledding and tubing. 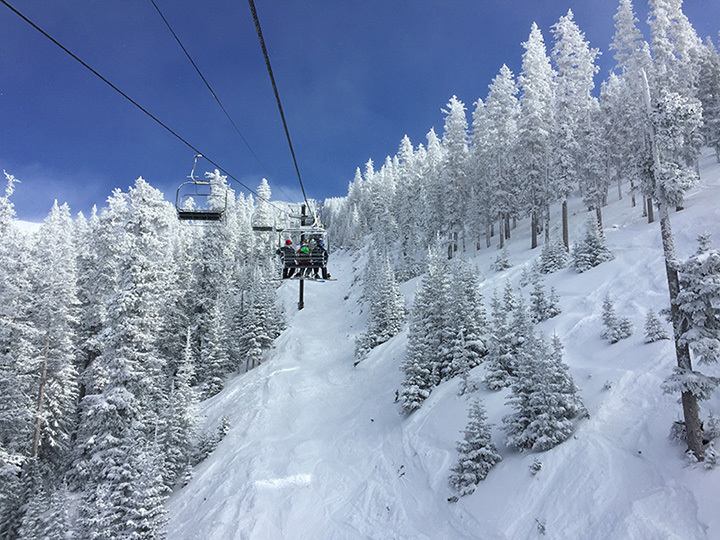 Arizona Snowbowl, on the western slope of Mount Humphreys near Flagstaff, gets an average of 260 inches of snow and covers 777 skiable acres. The never-ending debate about which mountain is superior may never be settled. “The Polar Express” is a beloved story about a child's train ride journey to the North Pole. The Grand Canyon Tour Company brings the tale to life with its own magical train ride. The train ride is a 1.5 hour round trip from the Williams Depot to the North Pole. Children will be read the classic story as its events unfold before their eyes. During the ride, they can drink cocoa and eat cookies before getting a special visit from Santa and his reindeer. Las Noches de las Luminarias is an annual festival at the Desert Botanical Garden. The garden is lit up by thousands of luminaria bags in celebration of the holidays. Visitors can stroll through the garden as the lights enhance the desert scenery. For music fans, various concerts are held nightly ranging from Mariachi bands to the classical crossover band Simply Three. Voted "Best Holiday Experience for Children" by Arizona Foothills Magazine readers, the North Pole Experience offers kids a sneak peek inside Santa's workshop. The journey begins with a trolley ride from the Little America Hotel in Flagstaff that transports kids straight to the North Pole forest. Once there, kids are given a hands-on tour of Santa's mail room, toy factory, Mrs. Claus' Bakery, and Elf University—where they work side by side with elves to make Santa's toys. Visits by St. Nick are frequent so make sure your kid is on the right side of the Naughty or Nice list. Yes, Arizona has sleigh rides. Every winter, Flagstaff's Windmill Ranch offers private sleigh rides to guests looking for a tour of a winter wonderland. The horse drawn sleigh rides are an hour-long tour of northern Arizona's snow covered Coconino National Forest. Once the sleigh bells stop ringing, guides will finish the tour by building a campfire and serving up hot cocoa to the guests. Every January, thousands of long distance runners gather for the Arizona Rock 'n' Roll Marathon. The running series consists of a full-marathon, half-marathon, as well as a 5K, 10K and kid’s race. Though targeted toward athletes, there is plenty to keep non-participants entertained. Spectators are encouraged to cheer on the runners and live music zones are sprinkled throughout the course. Many congregate near the finish line to enjoy the music, atmosphere, and post-race refreshments. The Tucson Winterhaven Festival of Lights is one of the longest running lights festivals in the country. For several weeks each December, the residents of the Winterhaven community open up their neighborhood to thousands of visitors. Nearly every house is decked out with a spectacular Christmas lights display. Tours of the lights are available via hayride wagon, bus trolley, and even a pedal-powered bus group bike. Arizona’s mild weather makes hiking a popular activity year-round. There’s no shortage of trails to choose from, but Camelback Mountain consistently ranks as one of the state’s best places to hike. Camelback Mountain's Echo Canyon Trail is the go-to trail for hikers looking for a challenge. The trail peaks at 2,704 feet above sea level, has a 360-degree view of the valley, and is a great place to watch the sunset. CitySkate is the only real outdoor ice rink in Phoenix. Located in downtown's CityScape development, the ice rink has open sessions from the end of November until January and is even open on Christmas. The downtown energy and holiday feel make this a great date destination. It's not quite Rockefeller Center, but it’s not bad for the hottest city in the U.S.
Arizona is the Grand Canyon state after all. The famous national park gets fewer visitors during the winter due to cold and snowy conditions. However, the less crowded conditions allow visitors to experience a calmer and more in-depth exploration of the park. Plus, the fallen snow makes views of the canyon even more picturesque. Sedona is one of Arizona's best tourist destinations. One of the benefits to visiting in the winter is that it's the offseason—meaning it's not quite as pricy. With temperatures regularly 15 degrees cooler than Phoenix, it often gets forgotten in the winter. But between the downtown shopping district, scenic red rocks, and many resorts there are enough reasons to make a trip. Glendale Glitters is the largest free holiday light display in Arizona. The display features over 1.5 million LED lights across 16 blocks of the historic downtown area of Glendale. Visitors can enjoy holiday entertainment, food, shopping, a snowfield, and a petting zoo. The event kicks off the day after Thanksgiving until early January each year. Kick off the New Year right by attending the NYE Block Party on Mill Avenue. Every year, the streets of Tempe fill up with thousands of partygoers celebrating among live music, games, and drinks. Last year, the event featured 18 outdoor bars and two stages for performers. If you’re going out on New Year’s Eve, this is the place to be. Attending a bowl game is a rite of passage for any college football fan. Fortunately, Arizona hosts the Fiesta Bowl, Cactus Bowl, and Arizona Bowl each year. These spectacles bring competition, tradition, and crowds to Arizona that make for an exciting event whether your team is playing or not.